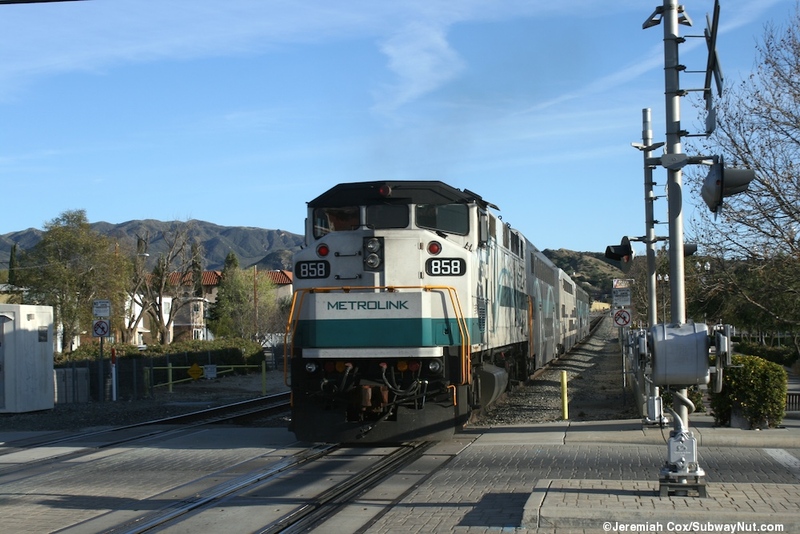 Newhall, the Jan Heidt Metrolink Station (named for Santa Clarita's first Mayor pro tempore, the city was incorporated only in 1987) is the first station of three, outbound trains stop at in the City of Santa Clarita and also the most recent one to open. 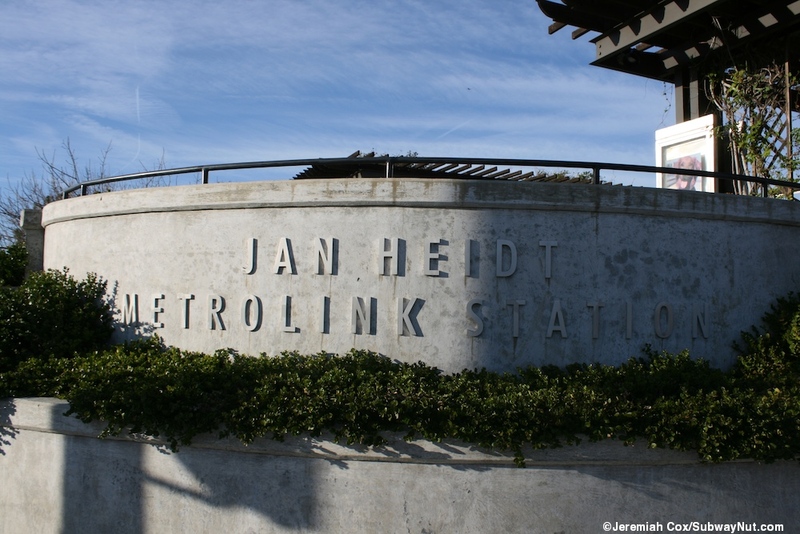 It opened as an infill station on March 18, 2000 partially as an attempt to revitalize the downtown shopping district. Four blocks south of todays Metrolink station (that your webmaster hadn't noticed until after he had visited the Metrolink train station is the historic 1887 built SP Depot, Saugus Train Station, open Saturdays and Sundays 1pm-4pm, the last passenger train stopped in 1971, the Coast Daylight just before Amtrak began). 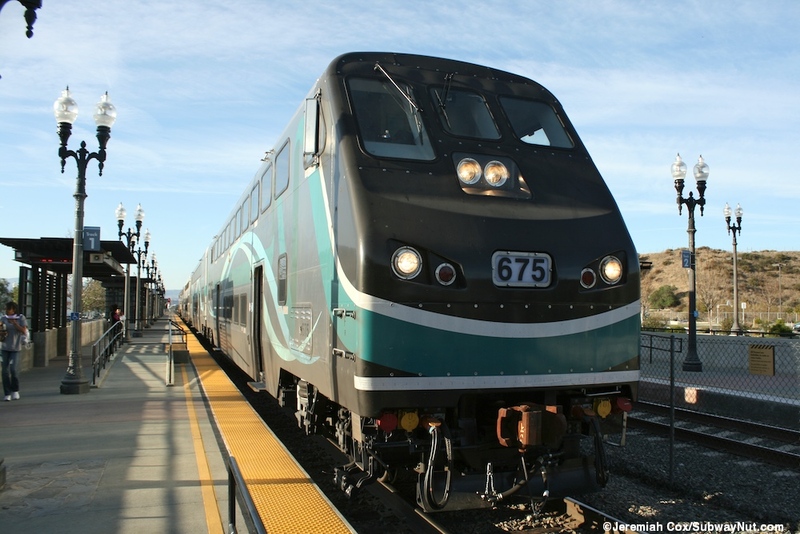 The station is the only intermediate Antelope Valley Line stop (not shared with the orange county branch) with two platforms for the two tracks than run through the station. 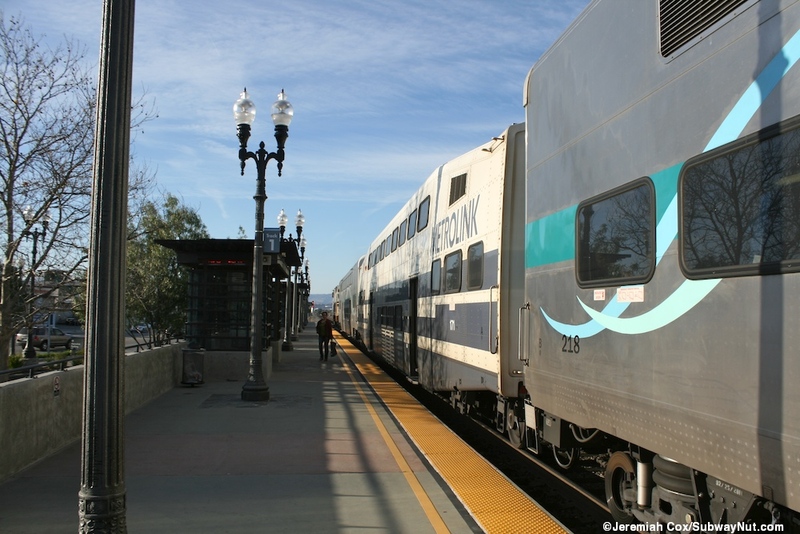 This gives trains the ability to platform in both directions. 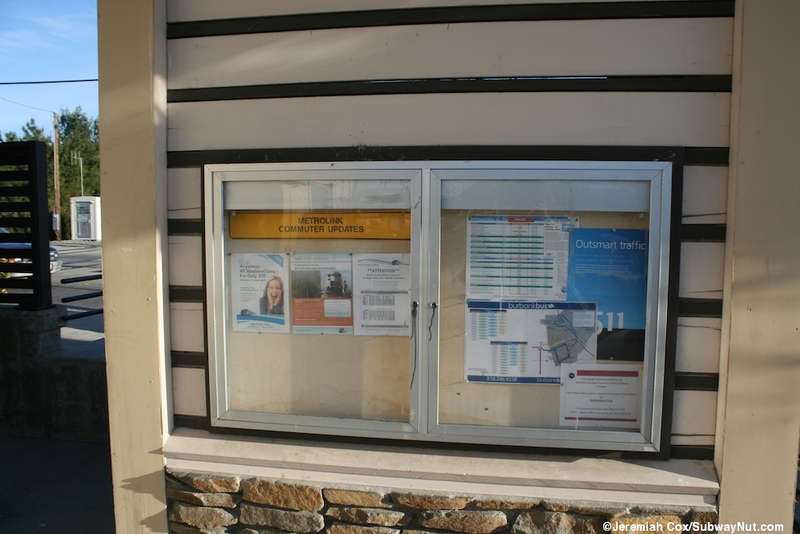 Unfortunately the stop's panels for boarding information have been vandalized so passengers must just assume there train will arrive on track 1. 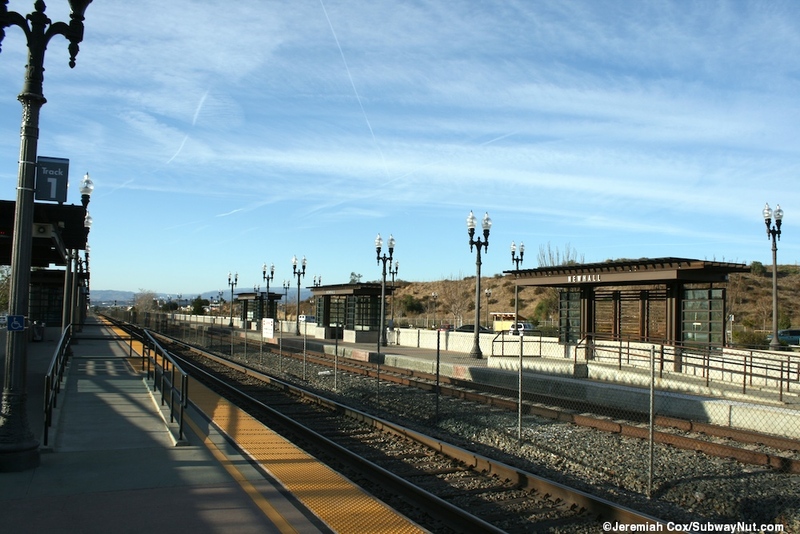 The two platforms are only connected at there southern, inbound ends via the grade crossing of Market Street, located here. 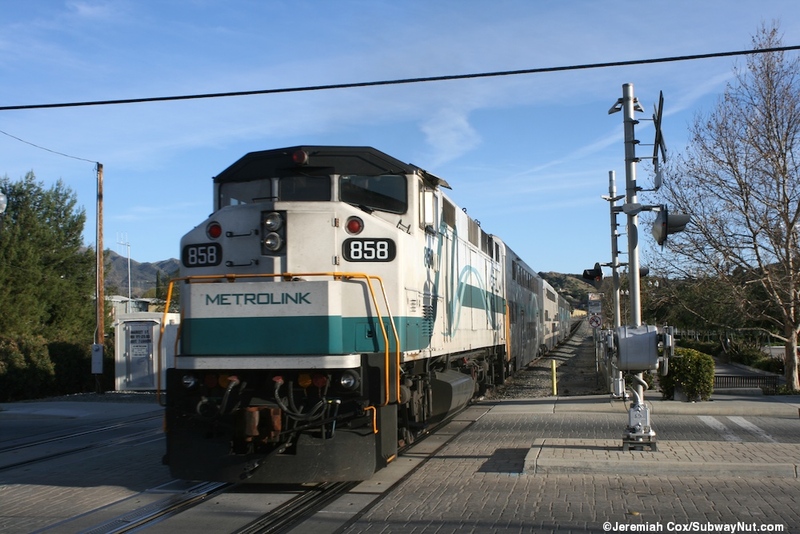 The Metrolink Station also serves an Amtrak thruway bus (the station is called Newhall-Santa Clarita, code NHL) that connects to all six daily San Joaquin trips in Bakersfield (it comes from either Torrance via Van Nuys and Burbank Airport or as a stop on a bus up from Union Station, travel is not permitted except to or from Bakersfield). 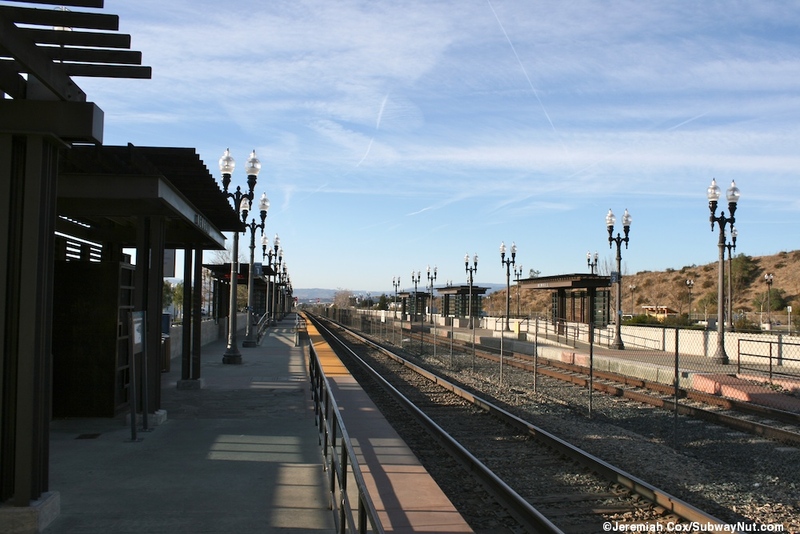 The two platforms each have (track 1, the western side has 6, track 2, the eastern side has only 3) small waiting shelters. These each have steel beams holding up roofs that look like there balanced on wooden slats. 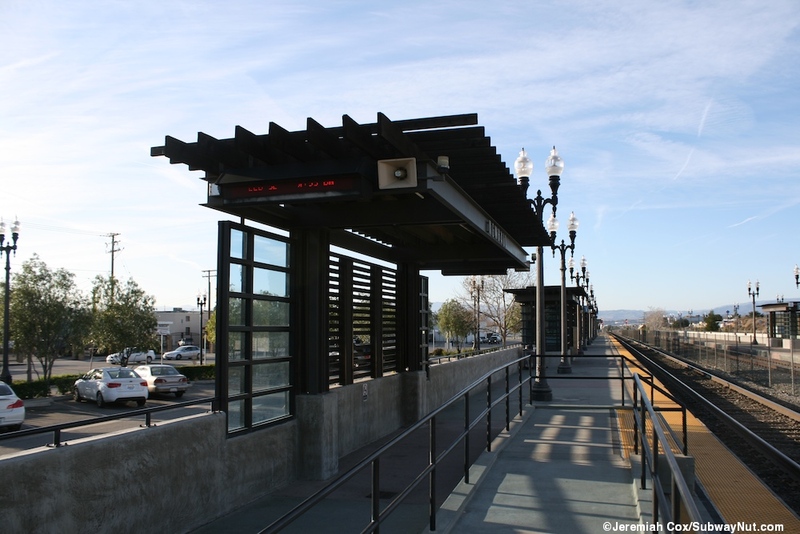 The main station signs is lettering spelling Newhall along the roofline. For waiting passengers there is a sculpted concrete bench and two little glass enclosures at either end (with their own little concrete built in bench). 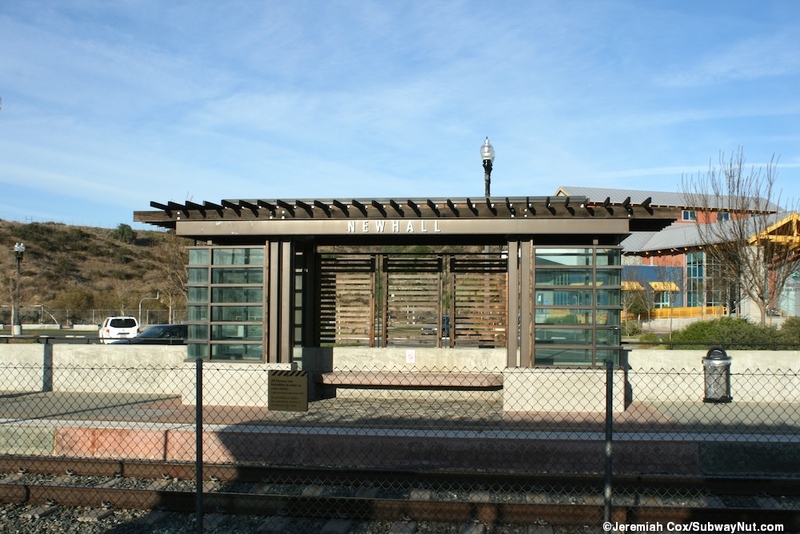 The main platform for track one is slightly raised from the surrounding streetscape. 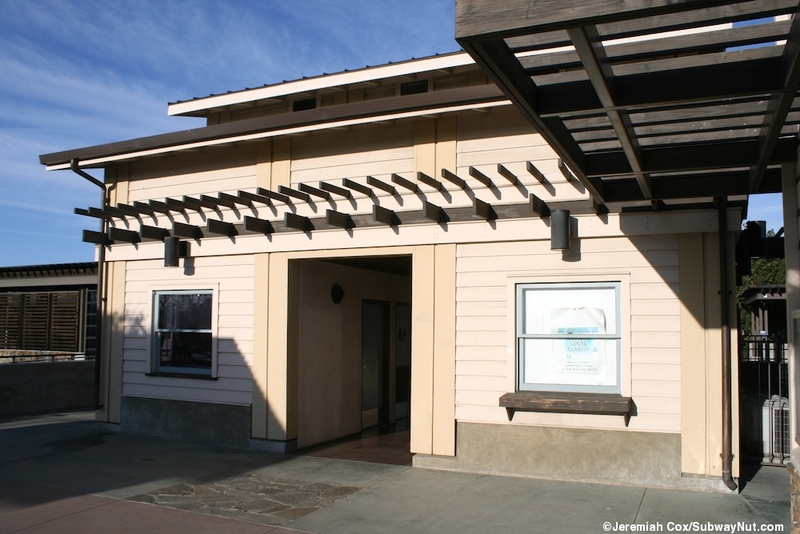 From the grade crossing, just before the platform begins (there is a fence along the track connecting the platform to the grade crossing) is the station's small building. 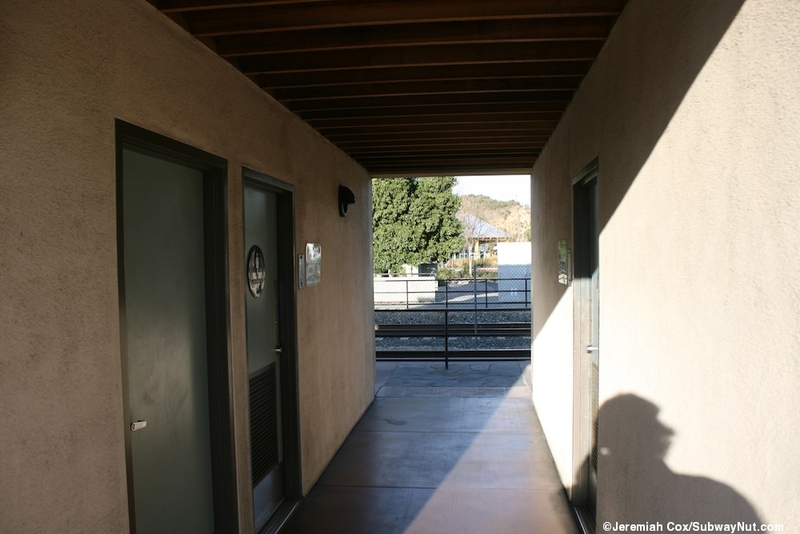 This has an open corridor going down the middle where the stations restrooms are located (open only on weekdays). There are also a few non-public areas but no enclosed waiting area. 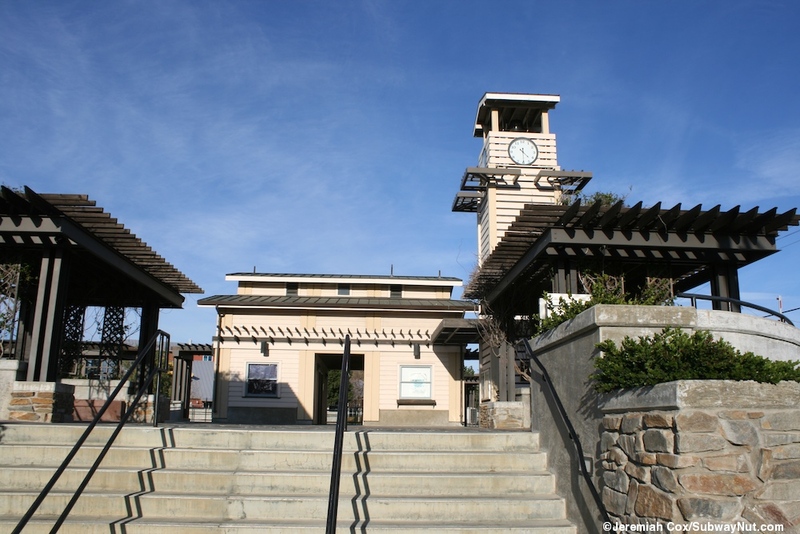 Next to the small building is a slightly higher white bell tower (like the modern towers at so many Metrolink stations) that looks like it is made of wood. 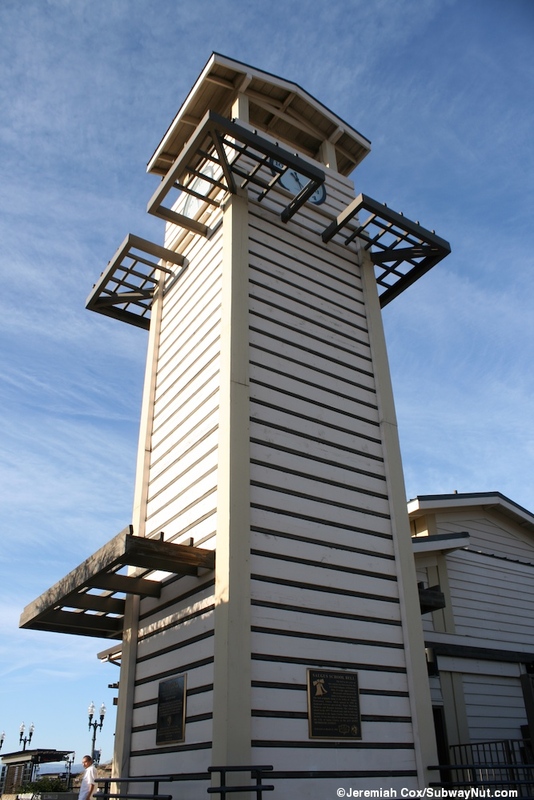 This tower, with the standard four clock faces, has a historic bell above them. 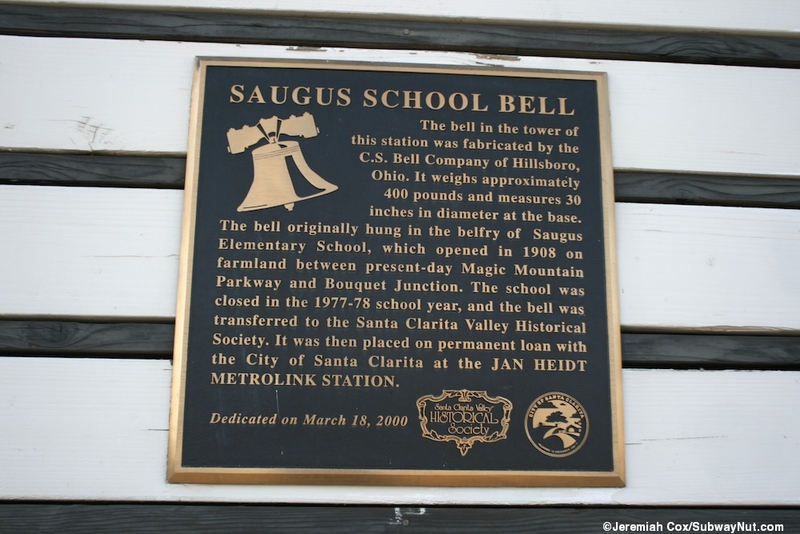 A plaque along the tower says the bell was originally in the belfry of Saugus Elementary School opened in 1908 closed in 1978 placed in the historical society and is now on permanent loan installed inside the small clock tower at the Newhall Station. 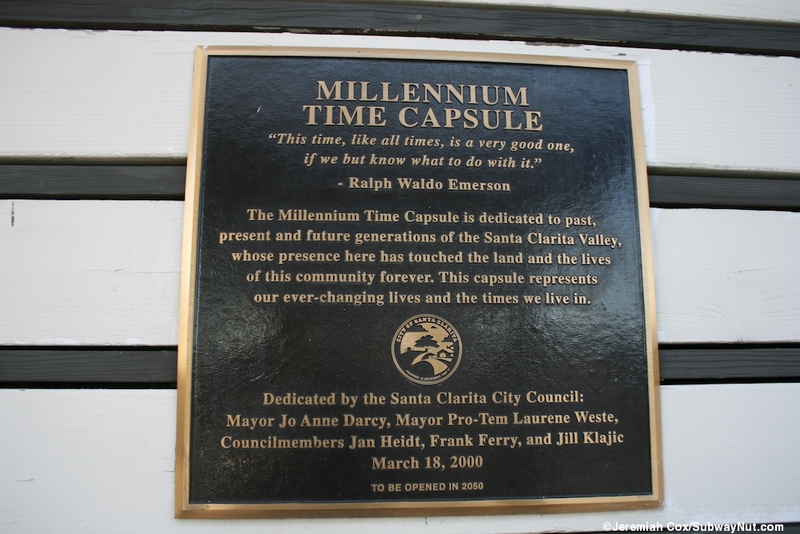 Another plaque discusses the fifty-year time machine that was placed in the tower at the station's dedication in 2000. 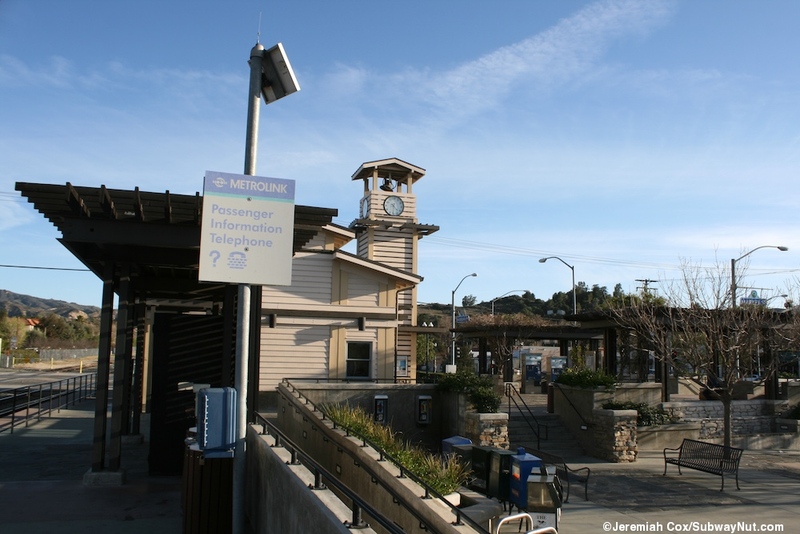 This leads out to a small plaza with two more shelters similar to those on the platform, opposite the platform, before a wide staircase leads down to Railroad Avenue (and a shorter staircase to Market Street that drops down an include to reach its intersection with this street). Just north of this intersection between the platform and Railroad Avenue (that curves to follow the railroad tracks) is the station's smaller parking lot. 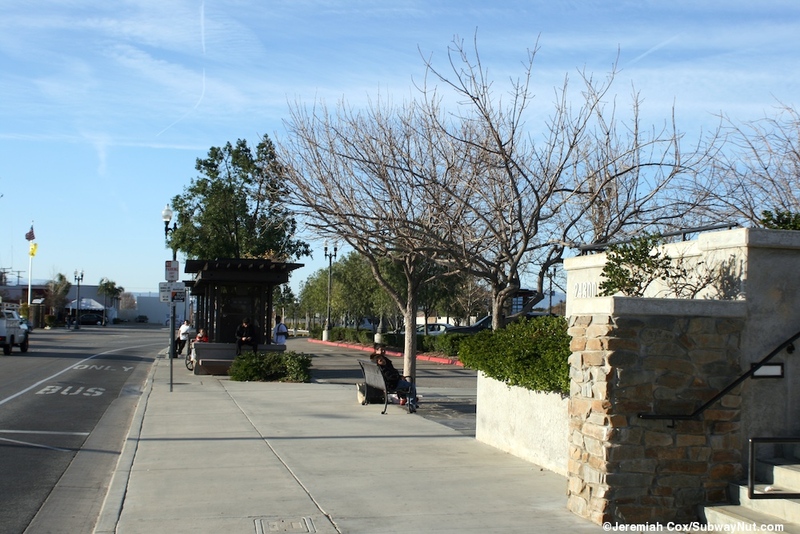 City of Santa Clarita Transit connections are either within the loop around this relatively small lot or right along Railroad Avenue. 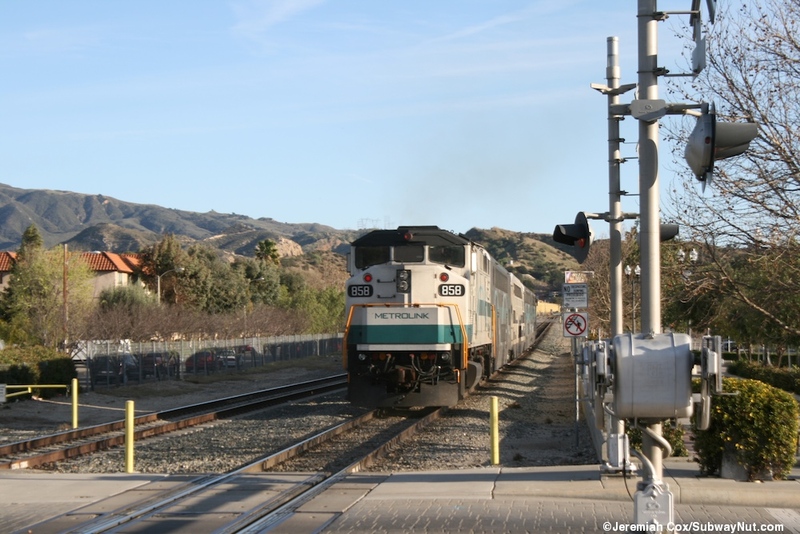 The more secondary track two begins a short ways from the grade crossing (a fence exists until the platform actually begins. This small intermediate area is designed so the train can have the crossing gates up as it stops in the station, often they need to go up and down through as the train enters, even if it doesn't cross). 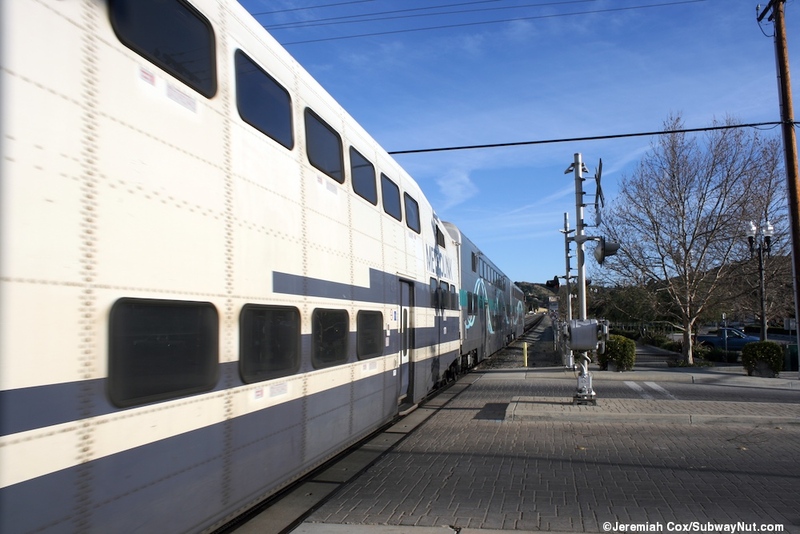 It is alongside the main parking lot, shared with the Santa Clarita Community Center where the majority of the stations 230 parking spaces are. A project was finished, costing slightly less than a million dollars to build 95 additional parking spaces and a passive outdoor recreation area.